If you are looking for a relaxing seaside break at a Hotel in Blackpool with fabulous entertainment then you came to the right place! We’ve got an unmissable weekend of entertainment coming your way very soon. They’re back again, one of our personal favourites but more importantly a highly requested favourite from our guests. You asked, we delivered! 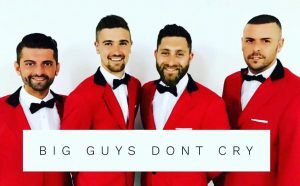 The incredible, crowd-pleasing “Big Guys Don’t Cry” will be back once again performing live at Tiffany’s Hotel on Saturday 29th June. You’ll be amazed at their superior vocals and cheeky crowd involvement. They’ll have you in awe at their unbelievable vocal abilities as they invite you to join them on the dance floor and have you “Join hands” as they march around the sea-view Cabaret Lounge to the cheesy-but-fun “Love train”. We all love a bit of cheese don’t we?